As an animal communicator and pet psychic, I find there’s a lot more to animals than we might think. Like us, they’re dealing with many issues. Although pets do have it easy — compared to the brutally oppressed animals exploited for food, entertainment, fur, clothing, lab-testing, and hunts — some pets often suffer the loneliness of not being heard. The boredom of being adored solely because they’re cute, when in truth they have a unique brilliance to share with us. The frustration of harboring rage beneath their people pleasing demeanors, just as humans do. Imagine being angry and not having someone to talk to about it. Guardians have the potential to go beyond the usual baby talk and commands with their pets. True, many pets prefer nothing more than sentimental gestures and being told what to do, just as some humans prefer not to interact. First and most importantly, set the intention to open your heart and empty your mind. Commit to hold the intention. If you let negative thoughts about the process get in the way, it won’t work. Sit with your pet the same way you commune with Nature. The same way you listen to music. The same way you prepare for a heart-to-heart talk with anyone. You become still. You breathe deep. Deeper. You take the moment in, breathing it down deep into you. 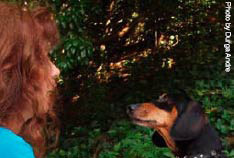 Feel the connection between you and your pet emotionally and energetically. According to the popular theory in the scientific community, String Theory, matter is energy. You and your pet and the space between consist of nothing more than tiny strings of energy. Your pet in front of your nose is already aware of this. Now, feel with an open mind, an open heart, an open body, for impressions. They could be in pictures, thoughts, emotions coming from your pet. Ask your pet either aloud or in your mind, a question. Listen. The answer may pop into your mind as a thought or visual. Or, fill you with a feeling. Or, even pop out of your mouth. How do you know if what you’re getting is real? You’ll know. Same way you always know when someone’s being real with you. As you gain confidence in your communication, you can tune into your pet even when you’re miles away from one another. Trust your ability. Animals can give us wisdom when we listen. Beau, a terminally ill Weimaraner, taught me something I won’t forget. His guardian asked during our phone session if Beau wanted to be euthanized. Beau told us he experiences dying to be as full of wonder and beauty as being born. He wanted his dear friend to feel excited for him about his adventure in dying, instead of pain about his condition. He said the physical pain he feels couldn’t possibly overpower the joy he felt in her presence. He preferred to let nature takes its course, and die naturally, but, if his condition became too much for her, then of course, he would want to ease her pain by being euthanized. Dear Beau. I can’t help smiling, thinking of Milo, the cat. My new clients were at their wits end when they asked me to come over and rescue their carpet and furniture from Milo’s months-old habit of leaving his ‘mark’ throughout the house. When I asked the eleven year-old delinquent what his problem was, a slew of obscenities flew out of my mouth. Milo ranted on saying he was tired of living with a “couch potato” — Summer, the female cat in the house. He felt insulted having to live for years with the “lowlife” who, he declared is way beneath him in IQ. Said he misses his young bright feline buddy from a long time ago. The diatribe finally ceased. My new clients reassured me I wasn’t crazy by telling me Milo in fact did have a younger sister with whom he closely palled around years ago and he was often nasty to Summer who does fit the description of couch potato. I asked Milo what could be done to help him feel more empowered and to stop wrecking the house. He said he wanted out. He wanted to be let outside every day so he could live dangerously like before. My clients gave me another reality check, this time by telling me Milo had been an alley cat. Milo now gets to go outside every day, never venturing more than a few yards from the house. With no more ‘traces’ of him to be found on the furniture and carpet, Milo is now happy and content, sitting out on the patio couch. Speaking of couch potatoes. Talking with your pets, hearing what they have to say, not only empowers them, you get to find out there’s even more to you than you might have thought. Ultimately it can be hoped, as we open up more to our pets, we will extend our caring to all animals, including the ones who end up on our plate.